During the Vietnam War, the Battle of Khe Sanh took place between 21 January and 9 July 1968 a buildup of U.S. Marine forces occurred and, after the base was cut off and isolated, actions around Khe Sanh commenced. The Khe Sanh Combat Base and hilltop outposts around it were under constant North Vietnamese ground, artillery, mortar, and rocket attack for 5 months and 18 days in one of the longest and bloodiest battles of the Vietnam War. 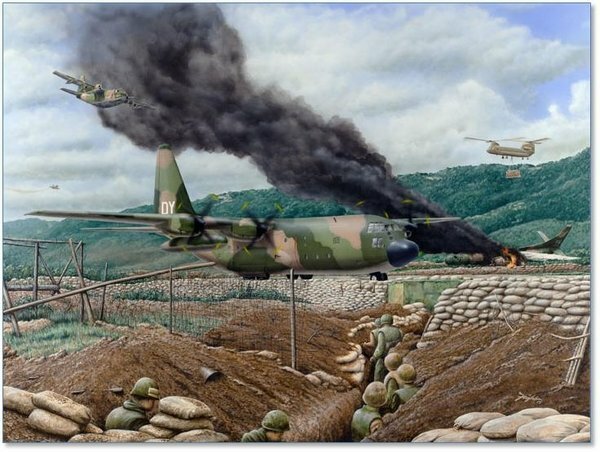 With the major supply route cut off by bad weather and enemy forces, the dangerous resupply effort of the base was left up to U.S. Air Force and Marine aircrews flying Lockheed C-130 Hercules and Fairchild C-123 Provider transport aircraft. The aviators had to brave bad weather, a storm of anti-aircraft fire during approach and departure, and became the targets of NVA mortar and artillery crews upon landing. Several of the big cargo aircraft were lost to enemy fire and became known as "Mortar Magnets" by the soldiers and ground crews. As a result, 65% of all supplies to the base had to be delivered via paradrops by Air Force C-130 crews.